Two breeds of beef cattle are called “longhorns” -- the English longhorn and the American or Texas longhorn. They're unrelated, but they have things in common. Both breeds were brought from the brink of extinction by 20th century enthusiasts, and both are known for exceptionally lean beef. They both get their names from their location of origin and their characteristic horns, which do not look the same. 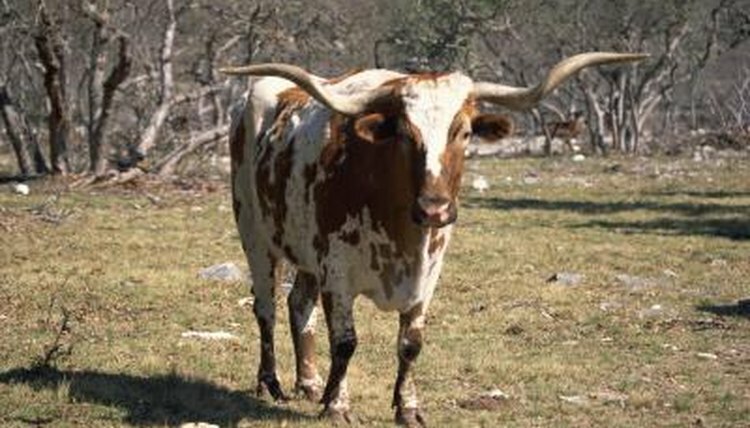 English longhorns' curve deeply inward toward the nose, while Texas longhorns' grow outward from the sides of the head to spans up to 7 feet. The Texas longhorn is something of a rarity among breeds because it developed naturally rather than as a product of human selective breeding, as a result of wild Spanish stock mixing with the free-range domestic cattle of settlers. The half-wild Texas longhorn was recognized as a distinct breed of cattle around the time of the Civil War, and it grew in popularity until the early 1900s. When ranchers started fencing their pastureland and open ranges declined, the Texas longhorn lost favor to other breeds. A movement to save the breed from extinction began in 1927, motivated by academic and historic preservation interests. In the 21st century, the demands of health-conscious consumers prompted a renewed interest in Texas longhorn beef. Texas longhorns reach maximum weight in less than 10 years and produce exceptionally lean meat. Longhorn beef has less cholesterol than a skinless chicken breast. A longhorn heifer breeds well into her teens, twice as long as other beef cattle breeds. These low-maintenance animals are adaptive and docile, they birth calves easily and they mature quickly. They eat a broader range of vegetation than other cattle, enabling breeders and ranchers to spend less money on herbicides and field maintenance. Texas longhorns also display a natural resistance to many diseases and parasites that infect herds of other breeds. In contrast to the Texas longhorn, the English longhorn breed was selectively bred and meticulously cultivated by Robert Bakewell, who saw a need in the 1700s for a hardy and productive breed of beef cattle to feed urban populations that swelled with Great Britain’s Industrial Revolution. Bakewell succeeded in developing a breed of improved size and quality that matured quickly. Before that time, ancestors of the breed were kept in northern England, primarily as dairy cows and beasts of burden. The English longhorn's popularity waned in the 1800s as farmers' preferences shifted to cereal-fed cattle with shorter horns. By the 1950s, the English longhorn breed had become rare. It was rescued by the Rare Breeds Survival Trust, which foresaw a coming interest in lean, grass-fed cattle. English longhorns are large cattle that, like Texas longhorns, produce uncommonly lean beef. Because of English longhorns' rapid growth rate, they do not develop layers of external fat common to slower-maturing breeds. The English longhorn is easily recognizable not only for its curving horns but also for the distinctive white line that runs along the ridge of its back and down its tail. English longhorns are efficient and profitable to raise, owing in part for the renowned ease with which they birth and raise their calves.